The parish of Biddlestone rolls down from the high ground of Wether Cairn, Puncherton Hill and Bleak Law to the relative lowlands just beyond the southern boundary of the Northumberland National Park. 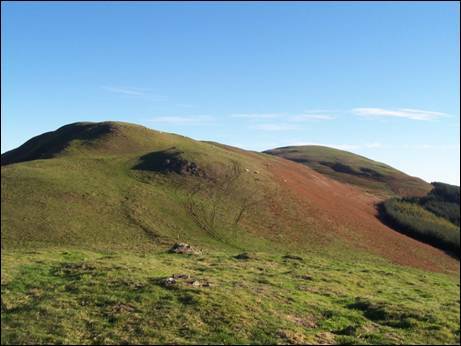 Whilst these are not particularly big hills the steep slopes, which climb up from the numerous hill-dissecting sikes, burns and cleughs, can be as testing as many of their higher neighbours. This is an area rich in the remains of former habitations, where panoramas open up as every crest is reached. This walk, reasonably short in distance, contains all the elements necessary for a perfect day in the hills. You will wander along the banks of the River Alwin heading for a switchback round of Clennell Hill, Silverton Hill, Loundon Hill, Cold Law, Bleak Law, Gills Law and Rookland Hill. You will end the day back beside the river as it rushes to a meeting with the River Coquet. So pack your sandwiches, you may wish to `tarry a while`. 1. The tiny village of Alwinton nestles below the slopes of Lord`s Seat and Castle Hills by the banks of the Rivers Coquet and Alwin. It is the last village in Coquetdale and home to the welcoming Rose & Thistle public house. You may wish to remember this for later in the day. Before reaching the village, immediately after crossing first the River Coquet and then the smaller River Alwin, turn right along the single track road towards the signposted, Clennell Hall. Before reaching the next bridge, which re-crosses the River Alwin, park considerately on the adjoining grass haugh (NT 925062). On with your boots and continue the journey on foot towards Clennell Hall, following the road which clings to the bank of the River Alwin. Soon you reach, on your right, Clennell Hall now an hotel and the site of a riverside holiday park. First mentioned in documentary sources in 1242 it is thought that the `deserted` medieval village of Clennell, once one of the `Ten Towns of Coquetdale`, was cleared to make way for the park and garden surrounding Clennell Hall. The hall itself occupies a strategic position at the entrance to the valley of the River Alwin and consists of a medieval tower house, an attached 17th century house and 18th and 19h century additions. It is a Grade II Listed Building. 2. Ignore the road which turns into the hall and continue with the river, passing first a small footbridge on your left, before crossing over a cattle grid. The road now becomes a red gravel track as you leave behind the shelter of the riverside trees and continue along the flat valley floor. Immediately after the end of the dry stone wall (NT 927073), leave the main track to your right, head through the large metal gate and climb the obvious green track which rises uphill in a northerly direction. Keep walking straight ahead until you reach a post and wire fence where you will need to turn left through a five bar gate. 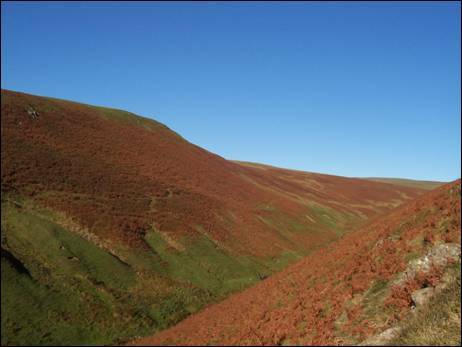 Once beyond the plantation on your right you will very quickly reach the remains of Camp Knowe, lying at the end of a high spur of Clennell Hill. 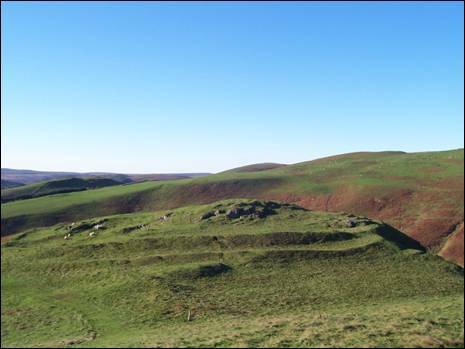 This defensive Iron Age hillfort (800BC-AD43) stands in a prominent position overlooking the valley of the River Alwin and measures 96 metres by 80 metres. It is enclosed by a large rampart of earth and stone and is a Scheduled Ancient Monument. After a short, sharp descent from the hill fort, continue upwards along the edge of the rock strewn slopes, enjoying the superb views down to the valley below as you go, before eventually turning eastwards to reach the 322 metre high summit of Clennell Hill. To the immediate north stands Rookland Hill, your final top of the day. But first, a few other hills to climb. So, heading eastwards across the top of the hill, descend slightly to cross the bridleway which leads to Old Rookland and, after passing through a small gate (NT 934082), climb straight up the rounded slopes of the 385 metre high Silverton Hill. Once at the top of the hill pause a while and soak up the views southwards over the Vale of Whittingham. Take note of the brooding backcloth of the Simonside Hills. 3. Leave the top of the hill by heading across its broad easterly back, dropping slightly downhill to join the red stone track, readily visible from a distance, which leads eventually to the hill farm of Puncherton. Turn left along this track as it begins to bend north eastwards up the side of Loundon Hill. After passing through a metal gate (NT 944088), leave the track to your right and walk the short distance to the top of Loundon Hill. At 394 metres in height, this is the highest of the hills climbed so far and a mere 5 metres lower than the next hill on the menu, Cold Law. However, as you look eastwards towards the deep valley of the Biddlestone Burn and the steep sided hill beyond, the ascent of Cold Law appears to be a somewhat different proposition. Heading in the same direction, and keeping the fence approximately 50 metres to your right, walk downhill, in a south easterly direction, towards the settlement of Biddlestone. As you head towards the edge of a plantation you will pass, on your right, the remains of a British-Romano period (AD43-AD410) settlement. With walls still standing to a height of 1 metre, the settlement consists of two roughly circular enclosures and the remains of two circular houses. Continue downhill within touching distance of the plantation edge on your right and when you reach a gate into the trees (NT 952085), with Biddlestone Cottages clearly visible on the other side, you need to turn to your left for the very steep descent to the Biddlestone Burn. Climb the small fence at the bottom and carefully cross the burn. Now it is time to take a deep breath before commencing the very steep climb up the south western slope of Cold Law. 4. Like Clennell, Biddlestone was one of the `Ten Towns of Coquetdale` and is virtually drowning in history. Built in 1796 and altered in 1820 by renowned north east architect John Dobson, the impressive Biddlestone Hall dominated the hamlet for over 160 years. Home to the Selby family until the early part of the 20th century, the hall was used as a convalescence home during the Second World War before finally being demolished in the late 1950`s. It is said to have been used as the `model` for Osbaldistone Hall in Sir Walter Scott`s novel, `Rob Roy`. Continue to climb in a generally northerly direction and eventually aim for the tumbledown drystone wall and adjoining post and wire fence. When a gate in the fence is reached pass through and continue straight ahead, away from the fence, to reach the 399 metre high summit. Once at the top you will have earned a breather, so enjoy the extensive views in all directions. Just under ½ mile to the south east is Harden Quarry the only major site of mineral extraction in the Cheviot Hills. This is the place where the red felsite, used in the construction of the Mall leading to Buckingham Palace in London, was extracted. Could this have been the original Northumbrian `red carpet`? 5. Once again heading north, losing some height initially, you should aim to the left of the shelter belt of trees which lies to the north west of the lonely white walled cottage of Singmoor. As you begin to rise once again up hill, head towards the two adjoining gates and soon after passing through the one on the left you will join a bridleway and the accompanying directional fingerposts (NT 955098). Turn left along the bridleway and, in time, you will cross another fence, via a step stile. Keep with the track and once you have crossed the burn running through Iving Cleugh you will need to turn sharp left, before the circular sheep stell, to pass across the southern slopes of Bleak Law. There are wonderful views down the chasm of the Biddlestone Burn. When reached, cross over the fence (NT 944102) and then, in turn, the burn itself. 6. Now climb uphill, past the sheep stell, and head diagonally to your left towards the post and wire fence (NT 942099). Cross the fence, via the step stile, and immediately strike out straight ahead, in a southerly direction, to join a green track which leads you to the tufted flat top of Gills Law. At 412 metres this is the highest point of the walk and from here you can see the hill farm of Puncherton, surrounded by lush green manicured fields. It is a remote and peaceful place. Leave the top by heading south westerly as far as the post and wire fence. Here, turn left for a few hundred metres and then pass through the two adjoining gates (NT 943091). Continue in a south westerly direction, keeping to the highest ground, and within ¾ mile the ruins of Old Rookland can be seen, standing a little to your left beside three trees. 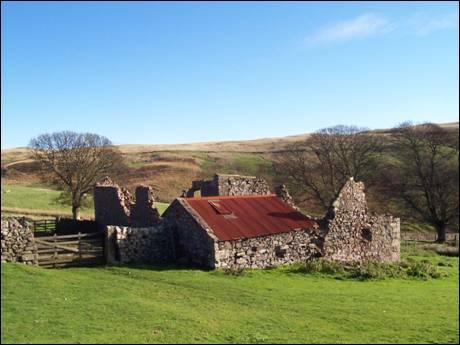 This farm was once the home of John Dagg, who left here together with his family of 4 children in May 1939 for a life at the remote cottage of Dunsdale in the Lambden Valley. In December 1944, John, his dog Sheila and a fellow shepherd rescued four crew members of a bomb laden U.S. Army Air Force B17 Flying Fortress aircraft which had crashed into Braydon Crag on the summit plateau of The Cheviot. As a result of their actions the shepherds both received the British Empire Medal and border collie Sheila, for her part, received the Dickin Medal, the animal equivalent of the Victoria Cross. The derelict farm is now a sad and lonely place. 7. Time now to head to your final summit of the day, the 350 metre high Rookland Hill. Depending on how far towards Old Rookland you have strayed (it is tempting to get up close) you will now aim in a generally westerly direction to make the very short climb to the top of the hill (NT 931088), from where there are superb views. Leave the top in a south westerly direction and soon a green track will lead you steeply down to the public footpath which wanders alongside the tiny Rookland Sike. 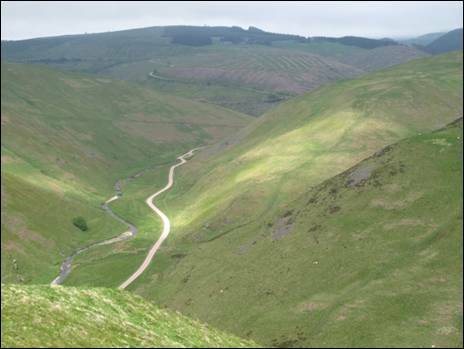 On reaching the thin path, turn right to join the gravel track (NT 925083) through the Alwin Valley. Turn left, crossing the bridge over the River Alwin, and, with the scree slopes of Clennell Hill rising steeply away to your left, start the 1½ mile journey back down the winding valley. You will have the twisting river for company and, if you are lucky and you keep your eyes wide open, you may just catch a glimpse of a long legged, long necked heron as it waits motionless and alert ready to strike its prey. To see this large bird in flight, caught between the flanks of this narrow valley, would be the perfect end to a delightful walk. Mainly mixed fell of grass & heather with a number of ascents & descents, some steep, gravel tracks & stretches of tarmac.